WATERVILLE — It’s been 25 years since the University of Maine won the NCAA Division I hockey championship, the first national hockey title for any Maine school at any level. 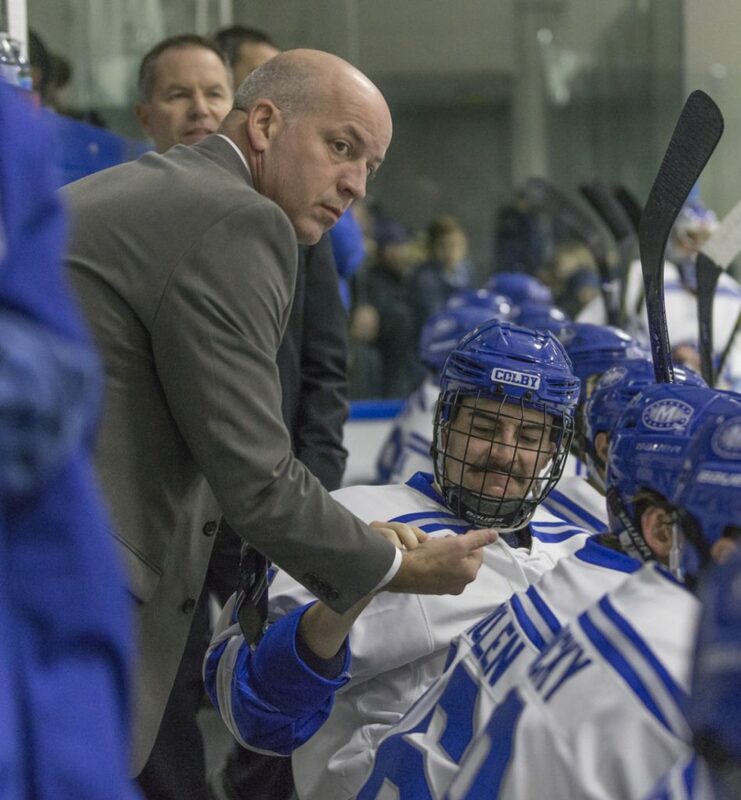 This weekend, Colby College will try to become the first program in the state to win a Division III hockey title when it heads to Lake Placid, New York, for the Frozen Four. The Mules, unbeaten in nine straight games, will play No. 1 St. Norbert College in a national semifinal at 6:30 p.m. Friday. The winner advances to the championship game at 7 p.m. on Saturday. There are similarities between the two championship runs, Maine’s in 1993 and Colby’s this month. And if anyone would recognize a resemblance, it would be Mules assistant coach Mike Latendresse. Latendresse, who coached Messalonskee High School to two Class B state championships, is in his fifth season at Colby as a part-time assistant. As a player who scored 41 goals in two seasons at Maine and another 122 in five years of minor league hockey, Latendresse is in charge of Colby’s power play and handles the forward group on the bench during games. Colby’s leading scorer for each of the last two seasons, senior winger Phil Klitirinos, credits Latendresse with helping develop his game during all four of his years on campus. When Latendresse left Quebec for college hockey in the early 1990s, he never imagined he’d become a fixture in central Maine hockey circles. But he’s raised a family in Winslow, bought ownership in Joseph’s Sporting Goods in Waterville and carved his primary career working for the Dead River Company in the heating and energy industry. “I don’t know if it’s a big legacy, but being part of this community is special to me for a lot of reasons,” Latendresse said. “My wife is from the central Maine area. My coaching tenure at Messalonskee was very special. The last several years at Colby has been great. So much so that the Mules plan on watching “Out of the Woods,” a film documenting the 1993 championship season, on the ride to Lake Placid. “You get credibility a lot of times as a coach in hockey through your background as a player,” said MacDonald, who was an assistant coach at Boston University when Latendresse was at Maine. “I coached against Mike and I saw firsthand what a tremendous player he was. He had tremendous tenacity and gameness, and it allowed him to play at a different level.